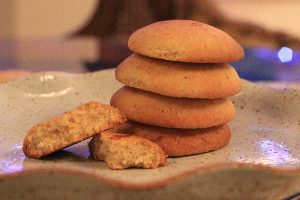 Nan khatai is an Indian shortbread cookies. It is egg-less light and crispy biscuit that's perfect to serve with tea or coffee. Get the right Bakeware set . Mix thoroughly all ingredients and knead into a pliable dough. Make small balls from dough and flatten them slightly. Place on lightly greased baking trays. Bake in a moderate oven at 350°F till golden brown. Remove Nan Khatai from oven and cool on a wire tray.